The Coalition of Veterans Organization will hold its next meting on the third Saturday in September, September 15th from 10 AM to 12:30 at Montford Point Marine Association at 7011 S Vincennes in Chicago. The August meeting is cancelled in recognition of the National Women Veterans United (NWVU) Gala, which everyone should attend! 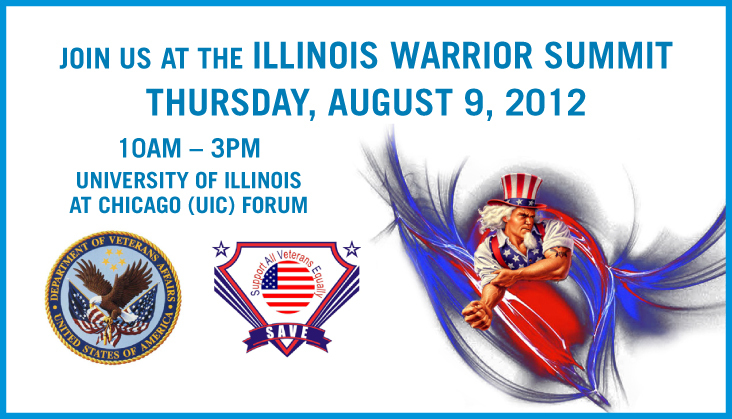 The US Department of Veterans Affairs, Jesse Brown VA Medical Center, Edward Hines VA Hospital, James Lovell Federal Health Care Center and Illinois Supporting All Veterans Equally (ISAVE) will be hosting the Illinois Warrior Summit and 5th Annual Welcome Home Celebration for 4,000 military, veterans and families on Thursday, August 9th, 2012 from 10a-3p at the University of Illinois at Chicago (UIC) Forum – (725 W. Roosevelt Road in Chicago). The Illinois Warrior Summit and 5th Annual Welcome Home Celebration connects military, veterans and families to services and programs with benefits, education, employment, housing, legal, disability, mental health, family and children services. Illinois Supporting All Veterans Equally (ISAVE) Mission: To connect military, veterans and families with services and programs to benefits, employment, education, housing, legal, disabilities, mental health, family and children services. About ISAVE: Many Active, Reserve and National Guard components return from service and have difficulty finding the proper direction and guidance for available programs and services. ISAVE is working to help unite the Illinois community to create an open referral network system, a standardized packet of information and a web based platform for everyone to use. Illinois Supporting All Veterans Equally (ISAVE) is a registered 501 (c) 3 Not-for-Profit Organization and currently works with the Illinois community to host veteran one stop shop resource fairs called, the Illinois Warrior Summit and Welcome Home Celebration. These one of a kind events promotes positive community relations and present military, veterans and families with many opportunities for future goals. The Illinois Warrior Summit and Welcome Home Celebration also advocates networking between different organizations which improves business to business relations; enhancing the quality of veteran support services, and in turn, helping thousands of military, veterans and families.